Die-cast from a durable zinc alloy, inserts install quickly with an Allen wrench or optional drive tool. Anywhere a threaded fastener is installed in soft wood. Inexpensive solution for reinforcing threads in soft woods. These threaded Inserts Plus Nuts are pre-bulbed slotted shanks making them easier to install than the straight shanks, they distribute the load bearing over a large area making them ideal in soft brittle or thin materials without damaging the parent material. BCP Fasteners inserts are designed for use in hard woods, like oak, cherry, and maple. BCP Fasteners inserts are ideal for use wherever assembly or disassembly could lead to thread erosion or stripping. The Jack Nut threaded insert is an economical blind fastener designed for assembly-line use in thin, soft or brittle materials. The tubing for a clean, finished appearance. HEXDRIVE THREADED INSERT. THREAD INTO WOOD [ONCE A HOLE HAS BEEN DRILLED] BY USING AN ALLEN WRENCH. THIS ALLOWS A STANDARD 1/4"THREADED BOLT TO BE INSERTED. SUCH AS AN ADJUSTABLE LEG ON A CHAIR. T NUT FURNITURE GLIDE ADJUSTABLE. Lot of 50 M5 x 0.8 x 2.5D Insert Length Helicoil, Screw Thread Repair Insert. Qty : 50pcs. Material : 304 Stainless Steel. Type : Thread Insert. Thread pitch : 0.8mm. Weld On Nuts. 1/4"-20 Thread. Bryke Racing Part #: 303-351x4. Lot of 50 M5 x 0.8 x 1D Insert Length Helicoil, Screw Thread Repair Insert. Length : 1D. Qty : 50pcs. Material : 304 Stainless Steel. 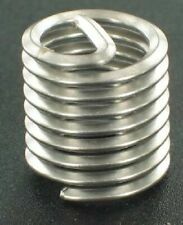 Type : Thread Insert. 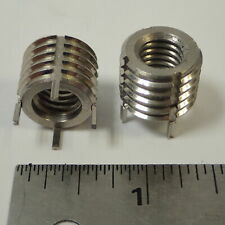 1/4" Helicoil Stainless Standard Thread Insert. 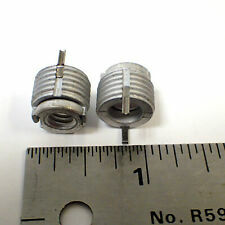 Thread Repair Helicoil Type Thread Inserts. These inserts compress upon installation to anchor in place. They distribute load and stress evenly to resist wear and are intended for permanent installation. 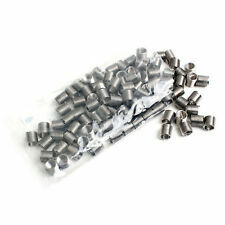 These zinc plated steel inserts have an external thread which is suited to wood. These inserts have an external thread with knife edges which bite deeply into the wood and keep the insert securely in place. Weld On Nuts. 1/4"-20 Thread.625" Big OD. Weld On Nuts - Long. 3/8"-16 Thread. Bryke Racing Part #: 303-355Lx4. Weld On Nuts - Long. 1/2"-13 Thread. Bryke Racing Part #: 303-360Lx4. The tubing for a clean, finished appearance. designed to insert inside steel tubular legs. External edges fit flush with the outside edge of. 14-20 Threaded Wood Insert- Drill 5/16 Hole. Screw insert in with a 6mm Allen wrench not included flush with face of wood. Insert bolt and you are done! Lot Of 30 Pieces- New- Unpackaged. Condition is New. Shipped with USPS First Class Package. (amda) New. Specifications include:M3 Threads and 1.53mm minimum sheet thickness. Zinc Hex-Drive Threaded Wood Insert. Flange Die Cast. LOWER 48 STATES ONLY! 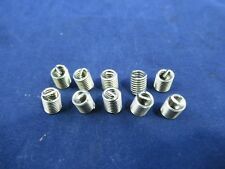 Recoil NEW M12x1.75 Metric Free Running Helical Thread Repair Insert LOT OF 10! 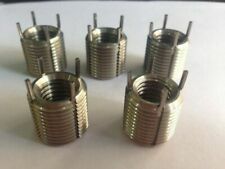 Recoil NEW 7/16-20 UNF Free Running Helical Thread Repair Insert LOT OF 10!